Need lots of room? Then this house is for you! Many people think of Orlando as a place to bring the family for an exciting and wholesome vacation adventure. And why not? Orlando is often called the "Theme Park Capital of the World", attracting more than 50 million visitors a year. Considering that the Orlando Metro area has a little more than 2 million residents, that's quite a feat. 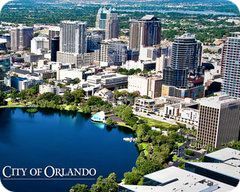 In fact, Orlando was recently named the most visited city in the country, ahead of even New York, Chicago and Las Vegas. But as we know, Orlando is so much more than just a tourist destination. With the cities arts and culture, our world-class restaurants, our thriving downtown and our beautiful parks, Orlando is a great place to live and raise a family. Even the cost of living is reasonable compared to the rest of the country. So let's talk some specifics about what makes Orlando one of the hottest destinations in Florida, or anywhere. It's true that the economic downturn our country has experienced over the past few years has affected Orlando just as it has other major cities. However, due to our booming tourism industry, Orlando has a lower rate of unemployment than the national average and the rest of the state. We also have a lower cost of living than just about any major metro area in the U.S.
Central Florida Research Park is the largest facility of its kind in Florida, and the 4th largest in the country. Backed by the University of Central Florida, the research facility draws dozens of companies and creates thousands of high-paying jobs in our area. Orlando is also home to a thriving high-tech media and software design industry. Orlando's housing market followed the rest of the nation up during the manic price increases of the mid-2000s. After the bubble burst, the median price of a home fell from a peak of $260,000 in 2007 to below $100,000 in 2010. Since then, the median price has recovered somewhat, to around $120,000 currently in 2013. Because of the downturn, many people owed more on their homes than they were worth, so they simply walked away. Foreclosure rates skyrocketed and homes sat vacant. Currently though, Orlando and much of the rest of Florida is experiencing a pickup in both sales and rentals of homes. And with housing prices remaining low, itâ€™s a great time to buy or even to rent a home in Orlando. Why Rent a Home in Orlando? During the construction boom of the early 2000s, builders were putting up some gorgeous homes. In many areas of the city, the resort atmosphere seemed almost dream-like. And when the market fell, the price of these homes fell along with everything else. But one thing that didn't fall was the beauty and high-quality construction of these homes. This is one reason Orlando is such a compelling market for renting a home. With everything our city has going for it, rental prices in Orlando remain below the national average for major cities. Currently the cost of renting a home in Orlando is below where it was in 2006. And with the job market starting to pick up, this makes Orlando one of the best places to rent in the country. Orlando is almost synonymous with theme parks and tourist attractions. No need to mention the more well-known parks like Disney World, Universal Orlando and Sea World. But Orlando also host more than 150 other attractions, such as the Harry P. Leu Gardens, Gatorland and Orlando Shakespeare Theater, among others. With all that Orlando has to offer, it's no wonder that so many people are coming to live in this beautiful city. There has never been a better time to find a home for rent in Orlando. We're one of the most family-friendly places to live in the entire country - and also one of the best values. Orlando is no longer just a great family vacation spot; It is also a great place for families to live!